Looking for the highest ballistic performance for your benchrest, F-Class, or tactical rifle? 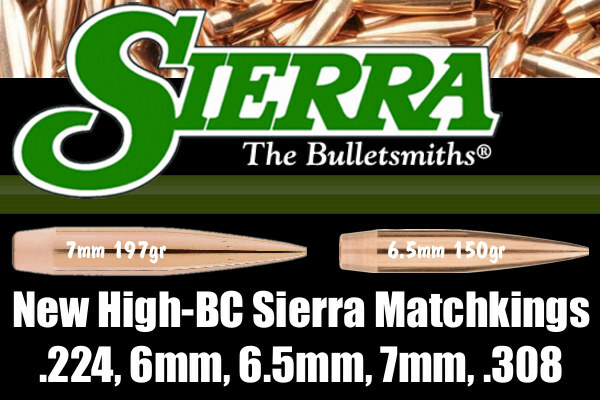 Sierra now offers a wide selection of ultra-high-BC bullets in a wide range of popular calibers. New Heavy .224 SMK – We just learned that Sierra will release a new-for-2018 95-grain MatchKing. This new .224 projectile, Sierra product #1396, has a claimed G1 BC of 0.600 — mighty impressive for a .22-caliber bullet. 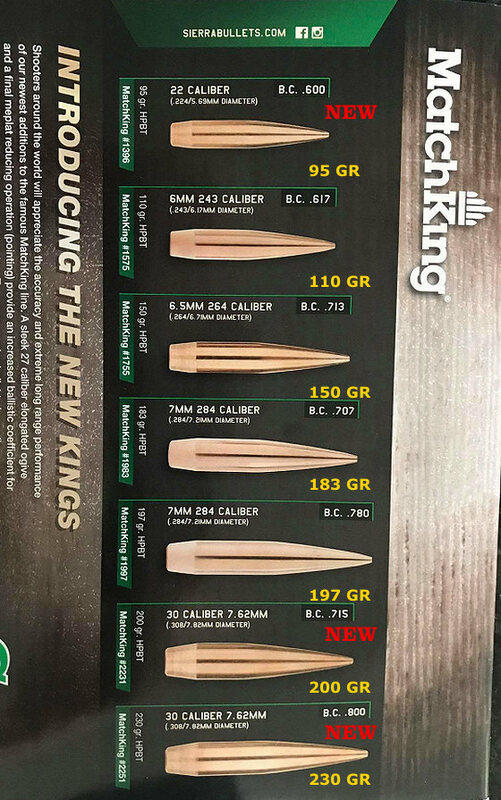 There are also two new .308-caliber MatchKings, a 200-grainer with 0.715 G1 BC, and a new 230-grainer with a stunning 0.800 G1 BC. Sierra previously released four other very slippery, heavy-for-caliber MatchKings that have raised the BC Bar for their respective calibers. For example, the 150gr 6.5mm bullet really “pushes the envelope”. In past years, 140-142 grains was considered “high end” for a 6.5mm match projectile. Here are Sierra’s BC Leaders for 6mm, 6.5mm, 7mm, and .308 calibers. Many of these New Generation MatchKings now come “tipped” from the factory for more uniform BC. One of our Forum members captured a spy photo with all the new-generation High-BC Sierra MatchKings in a line-up. This includes the new 95gr .224 SMK right at the top. The new 200gr and 230gr 30-cal SMKs are near the bottom. NOTE: Sierra already had a 30-Cal 200 grainer, #2230, in its line-up. This is a NEW 200 grain MatchKing, #2231, with a much higher BC — 0.715 vs. 0.565 for the older 200gr bullet. That’s a huge difference in BC, a 26% improvement. Share the post "Sierra’s New 95gr .224 SMK and other Ultra-High-BC MatchKings"